Details & Care: This Black Autumn Jacket is as versatile as it is lovely. Wear with slacks or a long skirt in cooler weather or use it as an accent piece or jacket for lunches outside or chilly restaurants. Perfect as a dress up piece or a dress down accessory. Details & Care: This lovely Blue Autumn Jacket is embroidered with the wonderful oranges, yellows and golden browns of fall. Work in the yard raking leaves, take in a cup of tea and relax with this tasteful fall compliment piece. 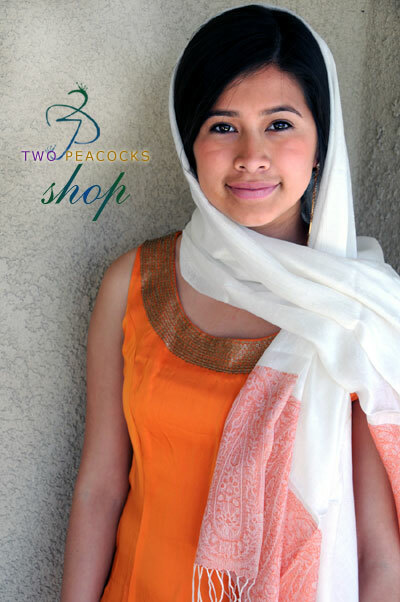 Wear with a turtle neck or swoop necked blouse to engagements or social events. Details & Care: A Cream Silk Jacket with embroidered flora’s in orange, yellow, greens and auburn makes this dress up accent piece a must have for the dress or dress down event. A compliment to any blouse, shirt, pleated skirt or slacks for the varying temperatures of any season or event. Beautifully lined and in a beautiful shade of cream this jacket is stunning and as versatile as it is lovely. Details & Care: This is a must have two for one set that you can use with different outfits. A very versatile frilled cotton skirt that you can pair with almost anything and a stylish red and blue top that you can belt with jeans, slacks or wear loose! Extremely comfortable and versatile pieces. Pair with a scarf (as shown) or wear alone. Beautifully detailed top has open sides. Skirt is made from soft cotton. 100 % Indian Soft Cotton. Details & Care: The compliment has a base black color and also has a matching waist tie bottom pant. Patterned colorfully with flora. You can mix and match these two pieces with other styles of clothing such as jeans, slacks, skirts or synch with a belt or scarf. On the go or staying in. This lovely piece is a must have and show! Details & Care: This lovely top is paired with matching waist tie bottoms. Patterned and colorful. Can be paired with jeans, slacks or a skirt. Likewise the draw string pants can also be paired with tops. Wear around the house or out on the go. Accent with Scarves (as shown) or go without! Details & Care: A beautifully accented green top that you can pair with slacks, jeans or a skirt (like the one shown – which is not included) but lovely and soft to the touch! Simple, elegant with a swooping neckline. Pair with jewelry or a scarf. Belt or synch with a scarf too! It’s your time to get creative! top only-skirt not included.